StackTack is a widget for bloggers and writers to easily tack questions and answers from the Stack Exchange sites such as Stack Overflow, Server Fault and Super User, into their articles. The widget remains up to date as answers get added, modified, voted on and accepted. It works by finding HTML elements with an id similar to "stacktack-518021" where the number is a Stack Exchange question ID. The widgets are then generated inside these containers. The widgets can be heavily customized, both globally and on a per-question basis. Stylesheets can be overridden to change the appearance and answers can be filtered in many different ways. See it in action with our live demo (defunct site). Complete information and instructions are available here on the StackTack Wiki. BSD - Do with it what you will, but please give Zamtools credit and please let us know what you're doing with it. We're curious to see how people use this. No download necessary. StackTack is globally hosted on Amazon S3. Simply add a reference to it in your HTML. StackTack is intended for use on web pages, blogs and articles. Anywhere an author may want to include a Stack Exchange question. Bug reports and communications can be made on the StackTack BitBucket bug tracker. StackTack has also been integrated into the SAggregator created by Farseeker. Any chance for this to be packaged as a WordPress plugin/widget? See Maxim Z's original question here. The StackTack plugin doesn't need to select the entire document to work, you can feed it any selection you like. The reason there is no class name override for the site parameter is because you can't represent a URL in a class name due to invalid characters. I have recently updated the StackTack plugin to allow class-based Stack IDs to be used in situations where IDs can't be added to your html. This makes it possible to post Tacks on Tumblr now because classes are not sanitized from html posts on their service. Log into Tumblr and go to your dashboard. On the right, click the customize link. I think that we should be able to specify the API endpoint/site inside per-question options. Currently, the site can only be specified in global options. 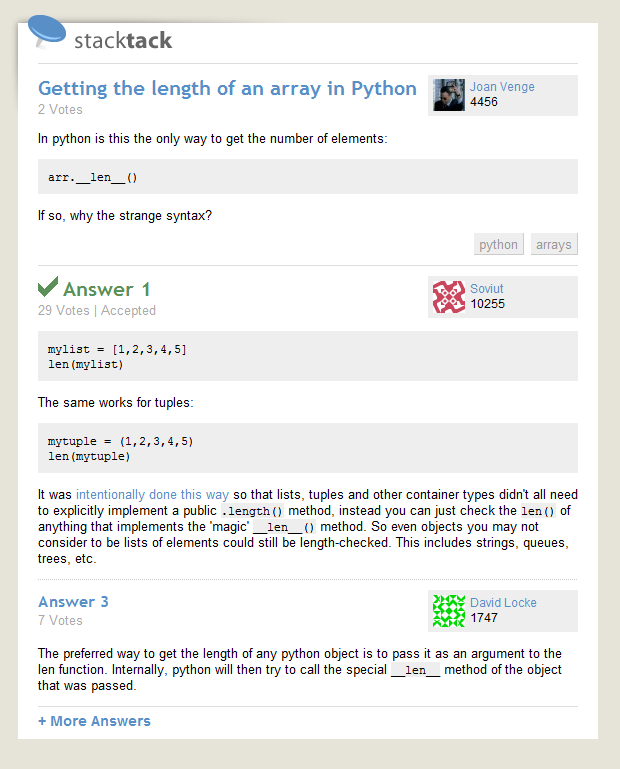 This means that all questions have to be from one Stack Exchange site. I added this to the issue list over at BitBucket, but I decided to post this here just in case. This is an example of how to add a Tack to a modal dialog using JQueryUI's dialog widget. Must say it's a pretty good app that I plan on using a lot more. If you'd like to experiment with StackTack but don't want to install it on your blog or website, then check out this live editable demo on JSBin. Just hit the Preview button to see it in action. Response capability It would be nice if this app did not only show the Stack activites but gave a chance to respond them. "Syntax error, unrecognized expression: [href=http://app.stacktack.com/stacktack.min.css]"
Stacktack works properly in jQuery 1.6.2. This is really a great app :) I liked it very much. Can it be possible to also pass the user-id as a parameter somewhere, so that the link to original question get's linked with the referrer and would help in Announcer and Booster badge. Updating the a href to required link would do the job here. Check this post to see the required js for this. Has anyone made a wordpress plugin for stack api?